Our white pearlescent pocketfolds are simple yet elegant and include all the special finishing touches that your wedding deserves. All white pearlescent pocketfolds are carefully crafted using 285gsm lustrous pearlescent card and finished with elegant satin ribbon. All inserts are printed with your guests' names and are fully personalised. All our white pearlescent pocketfolds are available in a wide range of card and ribbon colours to complement your wedding theme. 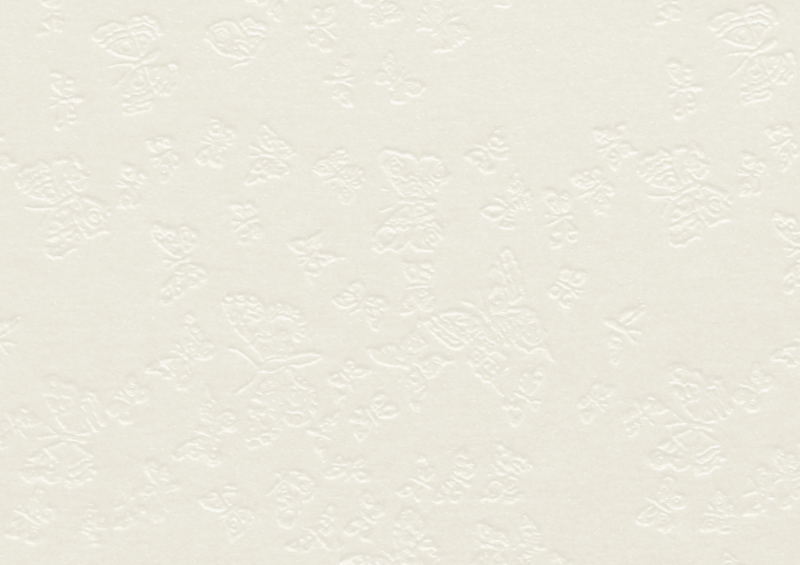 The white pearlescent pocketfold example shown is made using Diamond White Butterfly Embossed, Sapphire and Dolomite White pearlescent card. The ribbon colour is Gold. and to order using product code PF31L. All pocketfold wedding invitations include 2 inserts that can be used for information, gifts, directions to venue, order of the day, menu or any other additional information that may be required for your guests. Also included is an R.S.V.P card and return envelope printed with the return address. Printing of guest names in the invitation is included with all invitations, saving you time and the chance of wasting an invitation should you make a mistake when writing by hand. If however you wish to write the guest names by hand, we can leave a space for you to write, just let us know when ordering. We supply high quality posting envelopes with all our wedding invitations. These can also be printed with your guests' addresses free of charge, saving you the task of writing all the addresses by hand! The band that holds the Pocketfold closed may be tailored to suit your individual style. We have produced many variations for our couples, including plain printed bands, bands with a photo of the happy couple, removing the Swarovski crystals, plain band without ribbon and so on. We're always happy to work with our customers to produce a wedding invitation that is perfect for them. Printing on the reverse of the inserts is sometimes required to be able to include all the information about your wedding. We offer this for a flat rate of £0.25 per invitation. We can even add a place for guests to include their menu choices on the reverse of the R.S.V.P card. All of our wedding invitations are also available with evening invitation wording. 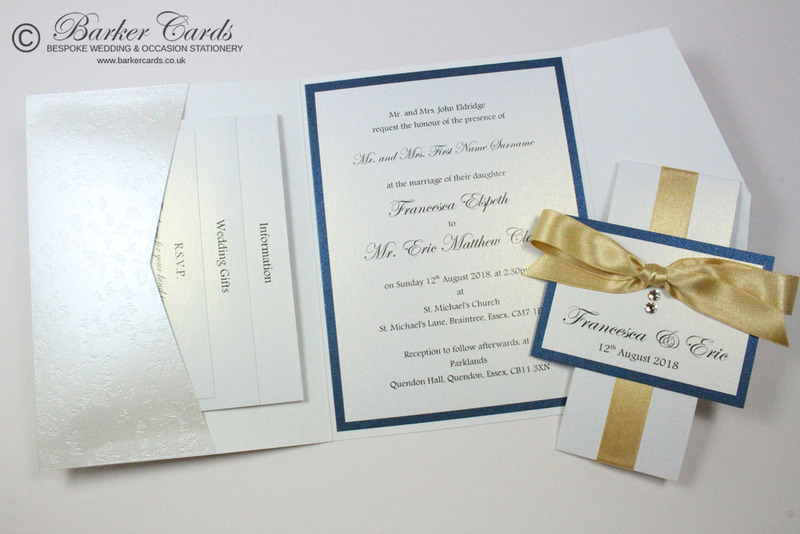 We also offer our quantity discount prices across more than one invitation range. So you can have Pocketfold invitations for your day guests and a simpler classic fold wedding invitation for the evening guests. We'll make both invitations from the same colours so that everything matches. We pride ourselves on our quality and attention to detail. We don't produce our invitations in bulk, every product is handmade to order by us, allowing our invitations and stationery to be tailored to your individual style / theme whilst also ensuring the finished product meets our exacting standards. We understand that choosing your wedding invitations is a difficult task with so much choice available. It is also difficult to get a feel for an invitation from pictures on a website, that's why we offer our customers a free wedding invitation sample, so they can see and feel the quality for themselves. Once you fall in love with a wedding invitation style, the next stage is putting together all the information that your guests need to know about your wedding day. With a vast knowledge of weddings, we are always happy to advise you based on what we have produced for other customers, and will make suggestions on suitable wording when producing your proofs. We always produce proofs for you to sign-off before producing your order, which enables you to see exactly how your wedding invitations will look before production and gives you a chance to amend anything you are not completely happy with. Once your wedding invitations have been lovingly handcrafted we check every one and place them in their corresponding postal envelopes, leaving them unsealed for you to check before posting to your wedding guests. We put a lot of care and attention into every order we produce, and strive to give excellent customer service to ensure you're completely happy with your wedding invitations. We are happy to work with our customers to produce unique wedding invitations and stationery. If you have a special idea in mind, please get in contact either by email: contactus@barkercards.co.uk or phone: 01376 569345 to discuss your requirements. We have a lot of specialist equipment that enables us to produce many different kinds of wedding invitation from printed designs, handmade pocketfolds and even gold and silver foiling. We love the challenge of creating something new. At busy times of the year we may require six weeks to produce your order, but it's not unusual for an order to be produced in as little as one to two weeks. Best practice is to contact us and specify when your order is required and we will advise if we have capacity. Booking a production slot for a non-refundable charge of £45 is advised if you want to guarantee us making your wedding invitations, so please contact us to arrange a booking. 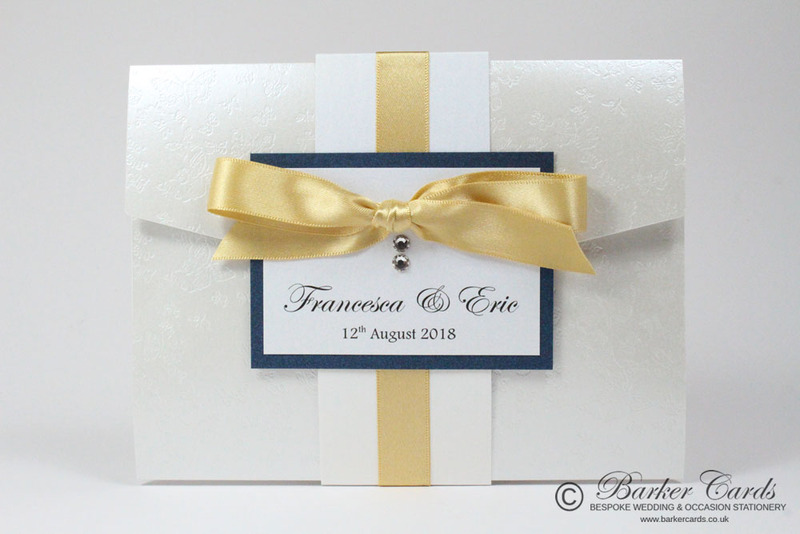 We take great care to ensure the quality of our wedding invitations is exceptional, but our care and attention to detail doesn't stop there, when your wedding invitations are ready for despatch, we will contact you to arrange for a delivery day that is suitable for you or arrange to deliver to a work place or alternative address. All invitations are delivered to you completely made up with all inserts carefully placed in the invitation and the invitations will be placed into their corresponding printed posting envelopes. All you will need to do is seal each envelope and pop a stamp on. Order a FREE SAMPLE Wedding Invitation today, made in your own wedding colours.